So, could Aaron Sorkin *ever* write women? An early stretch of Sports Night illustrates high points and low for Aaron Sorkin’s female characters. This criticism has been made about much of Sorkin’s past work. Even his most highly-regarded output (The West Wing, The Social Network) can be problematic; most of his canon fails the Bechdel test without putting up a fight. Last year, I wrote a few essays as part of a revisit of Sorkin’s first TV series, Sports Night, long one of my favorites. Republished here is a version of one essay, examining the show’s inconsistent treatment of its female leads, Dana Whitaker and Natalie Hurley. Natalie is sent to conduct a locker-room interview with Christian Patrick, an NFL star accused of assaulting the episode’s namesake. She, too, is assaulted, and initially intends to keep the story quiet. She fears—with good reason—the personal and professional shitstorm that’s certain to rain down, citing the real-life case of a Boston Herald reporter whose life was turned upside-down after a similar incident. Not only is the premise ripe, it’s uniquely suited to this particular show. It sates Sorkin’s need to tell socio-political morality tales while remaining completely relevant to the world of the show. One of the most frustrating failures of Studio 60 (and oy, is that a long list) was its habit of caroming into political digressions that were barely tangentially related to the world of a late night comedy program. “Mary Pat Shelby,” however, gives us a completely organic problem, something a team of high-profile sports journalists would be very likely to deal with. “Mary Pat Shelby” keeps the focus squarely on Dana, from the moment she consciously tabs Natalie to pre-interview Patrick (hoping to “provoke…a better response,” in Dana’s own words) through the many gut-check choices she’s forced to make as a marquee interview spirals into a morass of ethical quandaries. The result is a showcase for Felicity Huffman, who runs the gamut of emotions—elation at landing the interview, stoic integrity in fighting for her show’s best interests, guilt at putting Natalie in a dangerous position, quiet anger that such a dangerous position should exist at all—and she sells every moment. Simultaneously confronted with her duties as a journalist, her loyalties as a friend, and her sentiments as a woman, Dana stumbles, backtracks, and ultimately takes firm control of a no-win situation. It’s compelling television with a compelling heroine at its center. Natalie gets her moment too, and it’s quieter though just as deeply felt. 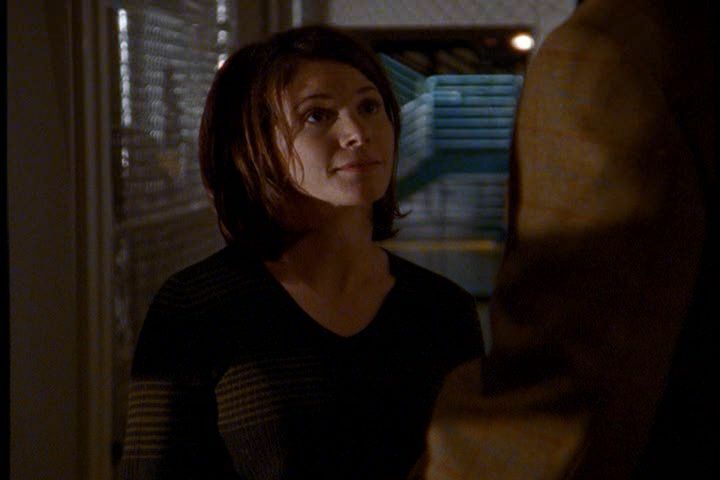 She confronts Patrick in the episode’s coda, a terrifically underplayed scene by Sabrina Lloyd (and by Brad Henke as a serial offender who’s perfected the art of feigning remorse). I absolutely love the line when Natalie asks her assailant if he remembers how much he wanted to play football as a kid, and off his fleeting sincere smile, guts him with “That’s how much I wanted to be a sports reporter. I was just there doing my job.” What a beautiful way to drive home the ugliness of his unspoken belief that her job, her ambitions, her life, are somehow less important because of her gender. I don’t think I paid much attention to “Mary Pat Shelby” during my initial fandom of Sports Night, but on repeat viewing now, I think it’s one of the strongest episodes of the series. What a shame, then, that such a meaty subject is frittered away in “The Head Coach, Dinner and The Morning Mail” (which, preceded by a “previously-on” montage, is positioned as the back half of a two-parter). To be sure, there is some good material in this episode, but much of it is undercut by the fact that the agency so confidently wielded by our female leads in part one is abandoned. Instead, much of the episode is seen through the eyes of Jeremy (whose dogged determination to see Natalie through her hard times inspires the latter two components of the episode’s title). First Dana and then Dan urge Jeremy to ease up in his “quixotic” and sleepless quest to insulate Natalie from the barrage of hate mail she’s receiving in the wake of pressing charges against Patrick. As individual scenes, I quite like these little heart-to-hearts. They give us nice insights into these personalities: Dana as a sharp judge of character, Dan as an old romantic soul. But within the context of this story, they take the focus off Natalie completely. She’s given astonishingly little to do in an episode that orbits around her. The only sign of the toll her ordeal is taking comes in the form of some scatterbrained screw-ups on the job, and frustration at her coworkers walking on eggshells around her. Again, this works okay on its own. As the entire extent of her reaction, we’re left wanting. The reason it’s all we see of her response, though, is because we see even less of the hardships she’s responding to. Faced with a perfect chance to engage with a real debate—the role of females, and female journalists in particular, in sports—Sorkin drops the ball. The only window we’re afforded into the arguments against Natalie is the aforementioned hate mail (including a death threat) from enraged misogynists. These are easy targets, cartoon black-hats. Plenty of truly dangerous opposition, as even recent events remind us, would come from old-guard, boys-club elements within the sports establishment, calmly making veiled arguments about a woman’s proper place. Less histrionic but no less sexist, this line of argumentation is all the more insidious for its veneer of respectability and politesse. Sorkin could have explored the very real backlash that Natalie and her comrades would have faced from within their very industry, from atavistic colleagues, from a network damaged by the stigma of bad publicity. Instead he only hints at a few half-literate troglodytes, and portrays them as more of Jeremy’s problem than Natalie’s to boot. In “Mary Pat Shelby,” Natalie fears the way American society punishes the victims of its own misogynistic tendencies. Then she bravely decides to stand up to her fear, and to her assailant, anyway. What follows could’ve been an episode, or an arc, about Natalie weathering the consequences of her bravery. Instead it’s a set-piece in the nascent Jeremy-Natalie courtship. Jeremy, narrating this epistolary episode, alludes to Natalie being in the papers and notes that “things have calmed down considerably here since then.” This comes near the end of a half-hour in which the only palpable consequence of Natalie’s ordeal is some lingering romantic awkwardness between her and Jeremy. For a storyline that should’ve been squarely in Sorkin’s wheelhouse, the lack of resolution is maddening. Another problem with turning the narrative over to Jeremy is that it exemplifies one of Sorkin’s most common missteps in writing women. Rather than fleshing out complete individuals, he frequently has his male characters put the female leads on pedestals and gush about how remarkable they are. The awed adulation tells us, rather nakedly, that we’re dealing with both a Strong Woman and an Enlightened Man. This is why I say Sorkin wants to write female characters honestly—I think on some level, he believes the praise he vicariously showers upon them. Unfortunately it reeks of tokenism when he relies upon, or forces, the audience to view their positive traits through the prism of a more robustly written male character. In “Dear Louise…”, Jeremy describes Dana thusly: “…an irresistible combination of brilliance inside the office, and something a little less than brilliance anywhere outside it.” Leaving aside the Sorkinese tendency of making a casual letter to one’s family sound like the summation of character in a dramatis personae, this is an early series crutch. Dana’s brilliance, or less than brilliance, and the degree to which we can resist either, should be up to Dana (and the more-than-capable Huffman) to convey. To digress a bit, look no further than the titular scene in the first-season West Wing episode “The Crackpots and These Women” to see this tendency in action. The female leads in Sorkin’s universe are confident and capable and level-headed without fail, except when their stumbles are coated in screwball-comedy charm. These characters don’t need to struggle or change, because they’re new forms of an allegedly-enlightened male ideal, modern Madonnas for those who prefer The New Yorker to Maxim. We know all this because Sorkin tells us so. It’s the soft misogyny of high expectations. TWTV Commentary: There is no canon of TV shows — How about a Hall of Fame? You left out something important, I think: Jeremy’s “quixotic” endeavor to protect Natalie from the hate mail involved him hacking into her account and deleting mails. And this is treated (by all the characters) as sweet and noble. But, really, it’s a tremendous violation and if Natalie or Dana were written as real women, they’ve have been furious by that kind of paternalistic overreach. The thing about Sorkin is that he’s one of those guys who believe that women want to be rescued, when really it’s more than there’s a certain kind of man who wants to be a rescuer. Great analysis. I loved this show so much when I first caught it a decade ago, but when I rewatched it more recently, these problems become more glaring. In season 2, when the network gives Sorkin *more* control, things really go pear-shaped. Dana becomes shrill and irrational, while Jeremy’s “paternalistic overreach” reaches all kinds of new heights. Only Dan lives unscathed, and I now believe that’s an accident. Thanks. Yeah, the whole Dana-Casey things, and the ridiculous convolutions it goes through in season two, really don’t do her any favors, although I do think she has some solid storylines apart from that.